September 18, 2013. Cybernet Manufacturing has developed two new 24-inch all-in-one computers: the iOne-H24 and the CyberMed H24. These PCs were both designed with tempered glass Pcap touch screen technology that provides anti-glare, edge-to-edge display access and multi-touch performance. Both of these 24-inch PCs are powered by Intel's i3/5/7 processor series, providing the performance needed for even the most demanding enterprise and health care applications. The iOne-H24 was developed primarily for the enterprise and business sector. This device was designed using industrial grade components for high reliability and a long product life cycle. With its Intel processors, the iOne-H24 can provide the power and performance needed for today's applications, such as virtualization, high-end graphic design and 3D development. The iOne-H24 also has an IP65 rating and is liquid-proof. This versatile PC can be used in factories, business offices, or in hospital administration. The CyberMed H24 is the latest in the family of Cybernet's medical all-in-one computers. As such, this PC is medical-grade, with the associated 60601-1 certifications, an antimicrobial casing to stop the spread of germs, and an IP65-sealed rating. The tempered glass Pcap touch screen design means that hospital cleaning fluids can't damage the glass in any way. 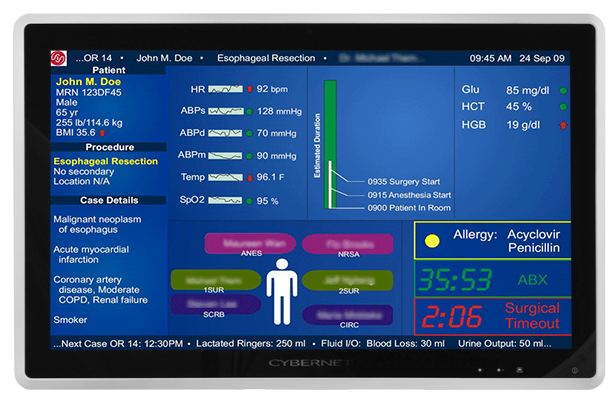 The physical dimensions of the CyberMed H24 conform to recent EMR software requirements for a 24-inch display area, and its thin profile (just 2.1 inches thick) certainly meets the standard for wall-mounting of less than 4 inches imposed by some states' health and safety codes. Cybernet's mission is to develop unique all-in-one PC technology that enables business, enterprise, and health care to run their critical software applications with power and speed. "PC technology must keep up with the pace of software applications, evolving user needs, and changing work environments," says Ali Bagheri, Senior Vice-President of Cybernet Manufacturing. "We make an effort to learn about new regulations that our customers face in their own industry, and how and where they use PCs day-to-day. Our R&D team finds solutions that meet their usage requirements and then we design our devices accordingly. Our H24 PC series is a good example of that, with the Pcap touch screen technology and their physical design. These PCs are thinner, have edge-to-edge touch screen access and meet the standards of almost any user environment."